The Bont backpack has a snappy look, black with green piping as well as black with red piping. 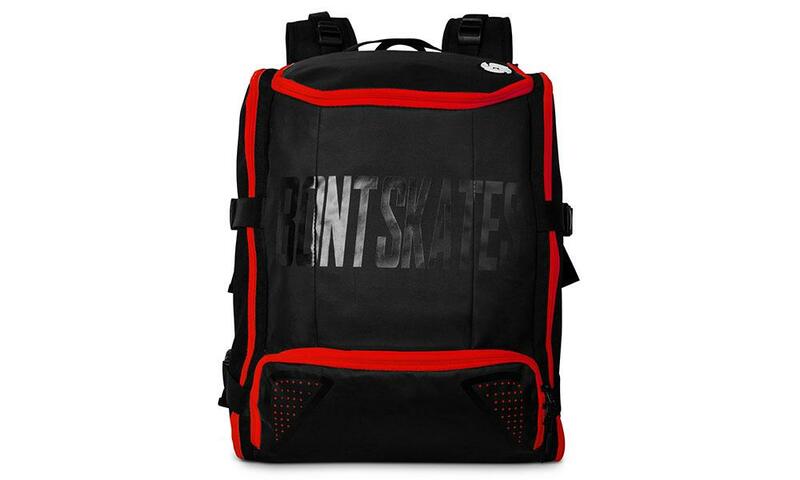 Designed to comfortably accommodate your skates on the outside of the bag and helmet in the top section. Loads of pockets for your bearings, skate tool and protective gear. I needed a skate bag to bring all my derby gear on transit since I've been taking two bags to fit everything. A few other players in my league have it and recommended it. I can fit my pads and helmet all inside the bag with quite a lot of space left. There is a laptop sleeve inside and then some mesh pockets on the front of the inside as well. There are two buckle straps on each side of the bag to hold your skates. I think the only downside is that there is no rain cover but I will probably just get a cheap one just incase. There is a lot of cushion for your back and so far it seems really sturdy and more supportive than my regular backpack. I'm looking forward to using this back pack. The only other thing to mention is that the bag makes you a little bit wider so you have to be aware that you'll probably clip doorways. Totally manageable though.